A little league umpire requires umpire plate shoes and protective gear, as the Home plate ump is subject to the same risks that a catcher has, such as foul balls off the foot and being slammed in the face by a baseball. In a way their risk is worse, because unlike a catcher who knows what and where he’s going in order to stop a wild pitch, the umpire doesn’t have a clue what the catcher may do. It's been rumored in the Big Leagues, there are times the catcher will do nothing to stop the ball, instead counting on it stopping when it hits the umpire. Only rumors. The clothing, for a professional appearance, consists of black or gray trousers and either a black or blue shirt. The shirt can be either button up or pull over, but must be large enough to accommodate Umpire equipment needed for protection. Shoes: They can be of the oxford, steel toe type or tennis shoes, but black is essential for a professional look. Depending on your style of umpiring, squatting low behind the catcher, or standing and leaning over the catcher, the comfort of the shoe must be considered. It can be a long afternoon, umpiring in shoes that are killing your feet. Shin Guards: Similar to the Catcher’s equipment the Umpire shin guard comes in various styles. Some have foot flaps for protecting the top of the foot from injury. Others stop at the bottom of the ankle and curve over the foot / ankle joint. Which style you choose is of person preference. I personally have not seem a lot of umpires taking balls off their feet, so I would suggest the more comfortable shin guards without the foot flap. Chest Protectors: Not to sound like a broken record, but essentially the same as Catchers’ equipment with one major difference. 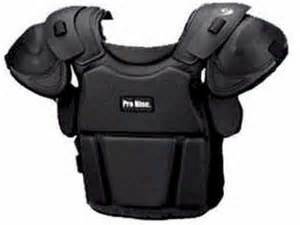 Chest Protectors come with or without the shoulder pads. I personally recommend the shoulder protection. It is more cumbersome to put on and your shirt will have to be large enough to encompass it, but a shoulder injury can be pretty painful. You’d be shocked how hard the ball is thrown or fouled backwards even by the youngest players. The second type of Umpire Chest Protection is what they call a Balloon Chest Protector. This is a large foam filled piece of equipment designed to be held by two straps attached on the backside. It is not worn, but carried. Awkward at first, once you become accustomed to the bulk it is easily maneuverable and offers excellent protection. It is also cooler to use as it‘s not worn. You will see this type of protector utilized quite often in Youth leagues, because it’s a one size fits all piece of equipment. Face Mask: The Umpires’ face mask is exactly the same as the Catchers’ face mask only, no attached helmet. It offers excellent vision and protection and although an umpire is not required to remove and discard the mask as a catcher, removal is quick and easy. Skull Caps: As far as I know umpires do not wear skull caps or helmets of any kind. There has not yet been proven a need for it safety wise. Groin Protector (Cup) Pretty self explanatory and believe me, you may get lucky for years, but all it takes is one good whack and you’ll regret not having one on. The Field Umpires, require no protective umpire equipment, but must wear the same clothing as the home plate umpire to maintain a professional appearance. Let’s face it, first impressions of an umpire is appearance. Look the part and you immediately command respect. Don’t look the part and you’ll be forced to earn respect. At times that may seem to be a long dusty road to travel.